This PDF 1.4 document has been generated by Adobe InDesign CC 2015 (Windows) / Adobe PDF Library 15.0, and has been sent on pdf-archive.com on 13/12/2016 at 01:29, from IP address 125.236.x.x. The current document download page has been viewed 2948 times. 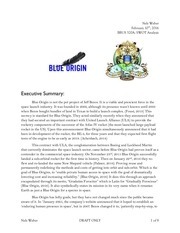 affordable launches to low Earth orbit. space from the Southern Hemisphere. across many areas around the world. to house imaging and communications technologies. How will each phase work? the launch vehicle for flight. postponed or scrubbed, i.e. rescheduled to another day. Test launches will be publicly notified. occur at set take-off times. and providing facilities for viewing launches during this time. Updates will be available at www.rocketlab.co.nz. will be minimum safe distances for vessels and aircraft also. These will be published prior to any launch. publicly-accessible point on the Māhia Peninsula. Temporary limitations will apply to the airspace over the site. through the standard NOTAM process. work with recreational and commercial users of the area. This file has been shared by a user of PDF Archive. Document ID: 00521353.